Project Dashboard gives an in-depth view of project activities for better monitoring and management of test cases their executions and milestones. This chart provides high-level understanding of how good your project is, testing-wise that is. 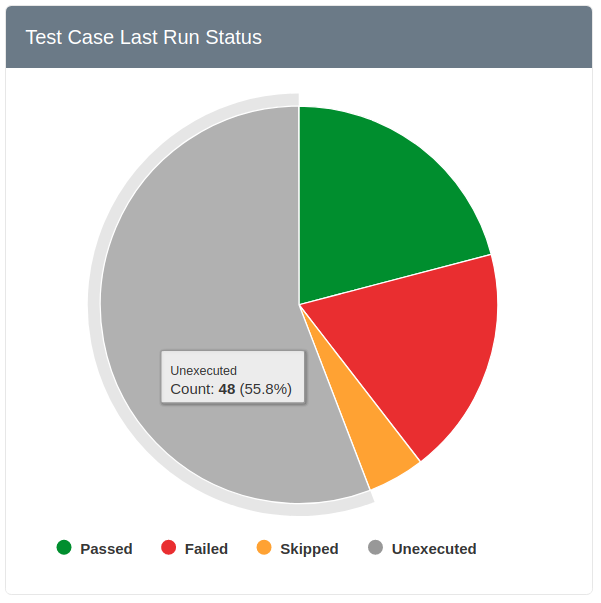 This report shows you last state of all your test cases. Pro-tip: As you add new features, your unexecuted test cases will go up. When working on new project, keep an eye on 'unexecuted' test cases and schedule execution on such cases every few days. Alternatively, drill down suite-wise to see statuses in further details. Over time, there are some test cases that take a lot of your developer's / tester's time. This chart will help you locate such outliers and let you further analyse why. 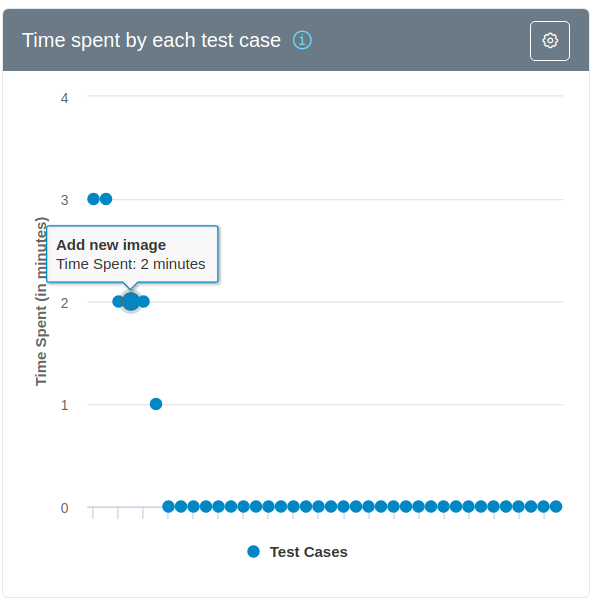 You can plot multiple time metrics for time spent on each cases: average time, overall, maximum, minimum etc. Pro-tip #1: Use this chart to locate outliers test cases, then run 5-whys analysis as to what took them so long. Pro-tip #2: Alternatively, you can use this data to decide which test cases should be automated before the rest. This is a distribution chart made of failure rates of your test cases. Highly useful when you want to pinpoint the troublesome cases of your project. 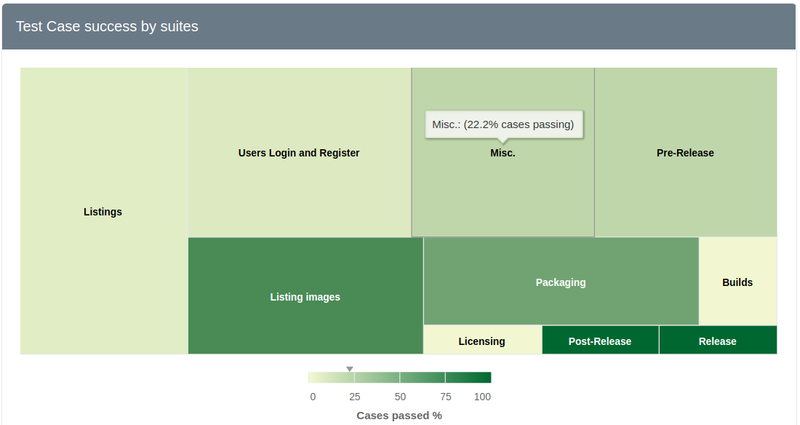 If you think testing all cases all-the-time is good strategy, this chart will be an eye-opener. 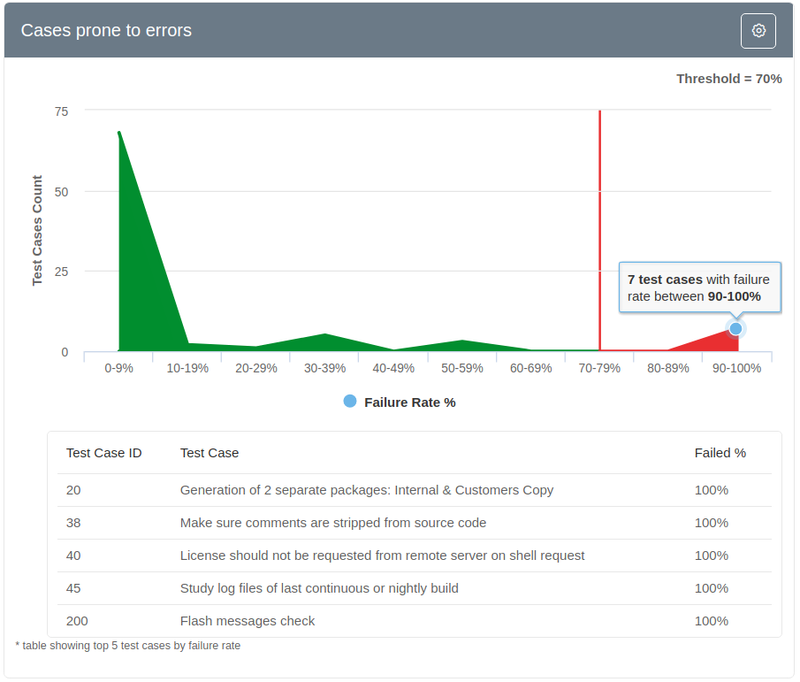 Sample use case: When developing new features, schedule testing of cases with overall high failure rates at relatively early stage. This will give your testers / developers more time to find cause of such failures resulting in less surprises on release date. Pro-tip: We've observed cases with high failure rates are often a sign of either outdated test case documentation or some big underlying problem. Pay special attention to the cases above threshold failure rate. Pro-tip: Sometimes a single module / set of features negatively impacts your project while other modules might be functioning as expected. This chart will help you locate such problem areas and act on them. Start paying attention to light green regions, find out what's lowering the score, is it development, testing or documentation?